Is Global Famine On the Horizon? 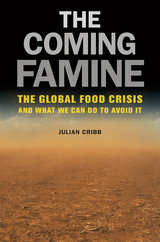 UC Press author Julian Cribb was recently interviewed on the Financial Sense Newshour about the arguments in his new book, The Coming Famine. Cribb questions whether we can sustain our food supply through mid-century, when governments haven’t been investing in science and technology for food production in a meaningful way. He believes it’s not too late to prevent a global food crisis, but we need to start planning now for what happens when oil and fertilizer become too expensive and farmers have lost significant land and water resources. Cribb confronts us with some uncomfortable truths: we’re not going to fix the food crisis with technology alone; we’ll have to change our diets—people will need to eat less, and in such a way that doesn’t tax the land at current levels. Listen to the interview at FSN.